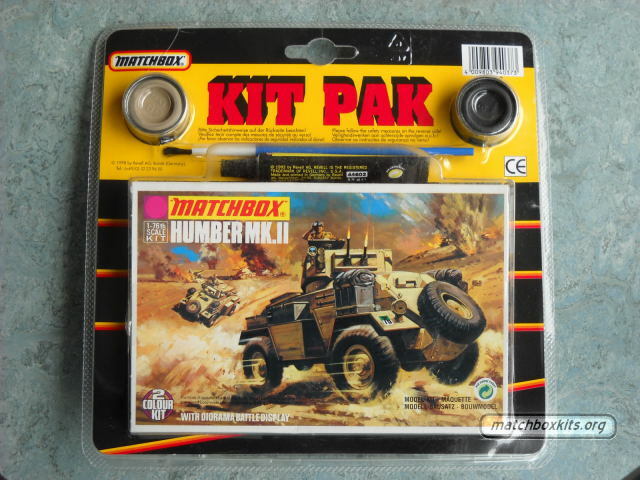 At the end of the nineties Revell released some kit paks of Revell Matchbox kits. Each kit pak got one kit from the purple range, one tube of glue, two tins of paint and one brush for the young artist. There were some small package variations. First we show four pix of a Humber in typical German packaging and two pix of the same in a package issued in the UK. Then we show Kit Paks of the BAe Hawk, in German and UK packaging. Finally we show two Kit Paks of the Messerschmitt Bf109E both issued in the UK of which the second has the same packaging layout as seen in Germany.